Beautify your decor and add a calming bit of Zen to indoor spaces with this illuminated table water fountain. 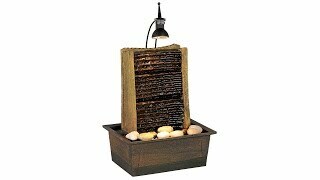 This charming illuminated table fountain will bring a new visual and audible accent to your home or office decor. The Zen-style fountain plugs into a standard outlet. 10 1/4" high x 8" wide. Organic Modern table fountain with built-in light at top. Comes with one LED bulb. Faux stone finish, lightweight resin construction. I've been waiting for this to be updated to an LED and now that it has and is on sale, I got it! This model has a soothing sound. I picked this because it was one of the tallest for the price and I wanted as much water sounds as possible on a budget. BEST ANSWER: The height without the light is approximately 9 1/2". The tub measures 7 3/8"W x 5 1/8"D x 3"H and holds approximately 1 Liter of water. Hi Dan: Thanks for your precise answer. I want to place the unit into my kitchen sink and run it it over night as an inexpensive air humidifier. How long does it usually run with one tank full. I think filling it with chilled water may help, also replacing the lamp with a little fan. Any words from the wise for this plan? The fountain will have to be refilled depending on the temperature/weather. The hotter the temperature, the faster the water will evaporate. Does the light turn off or on manually? Can the light be turned off while running? BEST ANSWER: The light does not have an on/off switch to turn it off. If you wish to run the fountain with the light off you will have to disconnect the light from the power supply. Yes, the light is piggy backed into the power transformer. So you would have to unplug (Just the light) to turn off. Economy Fountain is a Great Buy! I use this fountain at my office daily. It sits on my desk and is the perfect fountain for the environment. It's inexpensive price and design are what attracted me and I haven't been disappointed. Is it the most beautiful fountain out there? No, it's just some sort of molded plastic, but then I didn't pay for carved stone. The one I received had only three stones that I think are just part of the mold. I could always add more stones, but this really hasn't been an issue, just something to be aware of since the photos of the product show more stones. The thing I like most about this fountain is that it doesn't splash or splatter like most that I have tried over the years. Another nice feature is the light, at first I didn't think I would like it but the way it shines and reflects off of the cascading water adds a visual effect that is actually nice and brings more to the fountain than just the sounds of the water. Pump sound is minimal and is easily covered by the slightest ambient noise. This fountain, while not the prettiest one, is definately a great buy and I wouldn't hesitate to buy again. This tabletop fountain is worth the money. 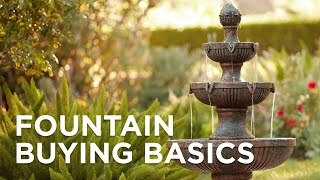 Unlike other, very complicated, fountains I've purchased in the past, no real assembly is needed, so it's extremely easy to set up. I added some stones, and it looks very attractive; in fact it looks as though it's make of rock (and not cheap, man-made materials). However, forget the light. The light is supposed to attach easily to the back of the fountain, but it doesn't. After a lot of fuss, I got the light attached, but it was pointing straight out instead of down at the water. When I tried to adjust it, it came apart. So I threw the light away and set up the fountain so that the sun shines on it during the daytime. I may try to find a small lamp to set behind the fountain, to illuminate it at night. In sum, aside from the light, I am very satisfied with this purchase. Ordered from amazon, arrived early! Great table top fountain! Nice sound to it...not to loud. Easy set up. Also love that if the bulb goes out, you can go on line and order more!! So buying another one!!! 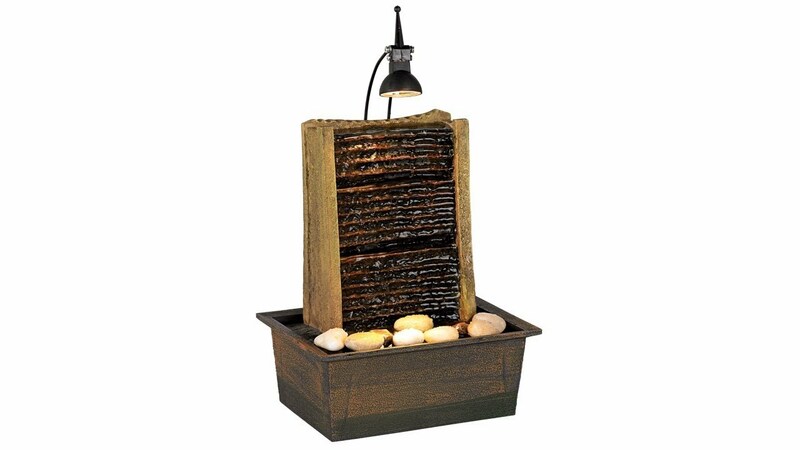 Sleek and earthy, this little fountain is a must for small places where you want to relax. Nice table fountain. Very easy to set up and easy to maintain. Very nicely priced. I love it, love it !! I really like that one. I even put some little rocks on top make's it more design in my entry way, just next to my leaving room, so I can hear the water falling down, when I am relaxing and I love the light that comes with it. Makes a nice effect on the water. I would certainly buy another one. And my husband loves it too. First, the staff I dealt with were truly wonderful. Next....the product arrived almost a full week AFTER the latest projected date of delivery, a piece on the inside of the water tank was broken off, and the light literally disintegrated in my hand when I tried to plug it into the socket. I tried a new light, but the mechanism is no longer in place to hold any light. If it all worked, it would be lovely, as otherwise it looks good and sounds great. Hi Lisa W., sorry to hear that your lovely table fountain arrived damaged. We've forwarded your comments to our customer service team. They have reached out to you to resolve the issue and make things right. Please reach out to them with any questions or concerns. Thank you. I received a table top water fountain as a gift and loved it. I knew it didn't cost much so when it stopped working after a month or so, I wasn't surprised. However, I really enjoyed the sound and the light while it worked and missed the fountain. 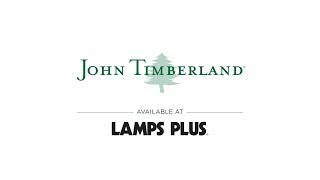 I did an Internet search and found Lamps Plus. I set up the fountain in my garden/hobby room and LOVE it! My sister had also been given the same fountain I had and hers stopped working. She works in a small office and the fountain was relaxing for her. I bought her a fountain from Lamps Plus, as well, and am so excited to give it to her!!!!! The price is right, no problem in putting the fountains together, and it just looks good and the sound of the water is soothing!! !